Are you thinking about having a new bathroom installed? Maybe you just need leaking bathroom taps repaired? Whether you’re interested in a full bathroom installation or just some simple toilet plumbing, AC Joinery can help with your bathroom fitting and repairs! We have lost of experience experienced and can carry out full bathroom installations, showers and wet rooms, upgrades, renovations and repairs. We can also fit can fit all types of bathroom fixtures including full bathroom suites, cabinets, shower cubicles etc. In addition if tiling or electrical work is required we can complete your bathroom to the highest of standards. Installing bathrooms can sometimes be a tricky and it’s important to have the correct pipework fitted, especially if you’re installing a shower, adding a basin, replacing a toilet, fixing taps or installing radiators as part of your project. 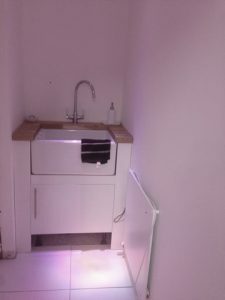 Fitting a new bathroom is usually a bigger job than expected so ist important to be sure that you need a bathroom refit rather just a few repairs and some redecoration. This is one way in which we can help and can really save you lots of time and money. To discuss repairing, replacing, installing or plumbing in a new bathroom, please get in touch to set up a suitable time for us to visit and provide a 100% free, no-obligation quotation. A broken toilet can really cause disruption to your home and installing a toilet replacement can be quite awkward, especially if you need to replace the cistern eg. If you are on a water meter, leaking toilets can significantly increase water utility costs. Faulty toilet flushing systems (cistern siphons) can also result in wasted water and higher bills. We always aim for minimum disruption to your property and most importantly we respect your house as if its our own, leaving it clean and tidy following our work. A C Joinery are happy to discuss your bathroom fitting and repairs requirements, and can visit areas across Manchester and South Cheshire, just contact us.